For Franciscans, the parish is the church’s hub. 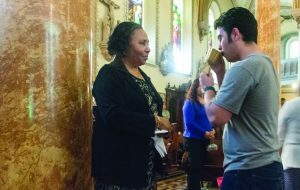 Friars serve parish communities in a variety of roles, crafting models of shared leadership and multi-cultural ministry. Imbued with the joy and hope of St. Francis and St. Clare, a Franciscan parish is where faith comes to life: community, liturgy, festival, the day-to-day life of discipleship, spiritual initiation and formation, the struggles and joys of the people of God, and most importantly, a mission: to go forth from the table of Word and Eucharist to tend the wounds of the world.